Your wedding dress will more than likely be the most expensive article of clothing you ever buy, so it’s important to become an informed shopper. The price of your Tampa Bay bridal gown is often directly associated with the quality and craftsmanship of the dress. The last thing any Tampa Bay bride wants on her wedding day is a wardrobe malfunction! I’ve heard horror stories of brides having to be stapled in their dress because of a rip or tear in the low quality fabric. I’ve even been in a wedding in which the “warehouse bridesmaid dress” had a faulty hem giving the impression that the bridesmaid had tucked part of her gown into her underwear! Tampa Bay bridal shop Malindy Elene Bridal provides insight on why bridal gowns are priced differently and what perks you receive for upping your wedding dress budget. Here at Malindy Elene, we know that our wedding dresses range higher in price than most other bridal boutiques in Tampa. Many Tampa brides (and grooms and father’s of the bride) ask me, “Why?” So I am here to explain! The easiest way to think about it is Who, What and Where. Who: All of the wedding dress designers we carry in our store are couture. This means that each wedding dress is made by the designer: drawings sketched out perfectly, fabrics are hand-selected, the dress is mocked-up, samples are chosen, and in addition to everything else, the designer selects certain creations to be included in their line. Another perk is that each wedding gown can have custom changes made to it! If you want to change the neckline, add sleeves, swap beadwork, etc., it can all be done! Some designers will even let you completely change the fabric or take the top of one dress and the bottom of the other and create your own gown! You can wear the custom gown of your dreams that is on trend with exactly what you see in the latest bridal magazine, while also receiving advice and recommendations from the wedding dress designer on what will look good! Think The Devil Wears Prada or the gowns you see on the red carpet. Each gown is perfected just for you! In fact, if you want a sketch done by the designer who made your gown, we can typically get one! 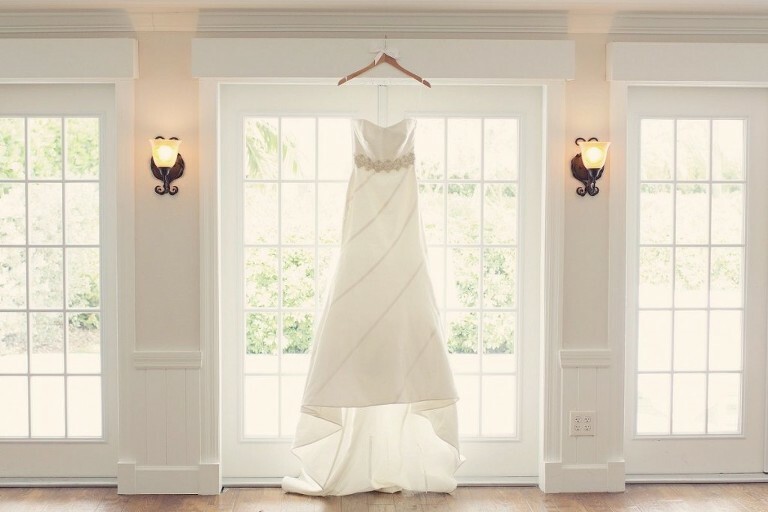 What: It begins with the types of fabrics used in a wedding dress: silk, silk blends and polyester fabrics. Silk and silk blends are going to be the best quality but also the highest in price. All of the crystals you see on our couture dresses, included our wedding gowns, are Swarovski crystals. Many brides know that name but for those that don’t, it is a very high-end crystal. We also use freshwater pearls and each piece of crystal or pearl is hand sewn onto the gown. The time it takes to create the dress in that manner,increases the price also! However, the quality you are getting with that kind of detail work and features is what makes your wedding gown unlike any other dress you will wear! On the flip side, gowns that retail for less are probably made out of polyester fabrics that will fade, be hard to alter or tear easily on your wedding day. The crystals will be clear or plastic beads that are often glued or pressed on via a machine onto the gown. This typically means that the beading will fall off easily or get ruined easily. Where: Many wedding gowns are made in bulk quantities in China. However, 96% of our gowns are made in the proud U.S. of A! We are happy to say that, although fabric is imported from all over the world, the majority of our gowns are constructed here! As in any industry, having products made in America will increase the price but at Malindy Elene Bridal, we take pride in American made products and love that we get to support them! Also remember, that thanks to each dress being made specifically for each bride, our dresses will take a bit longer to come in! Plan between 6 to 7 months for your wedding dress to arrive. Another aspect of the “Where” also includes the bridal shop that you purchase from. A true bridal boutique setting means that you will have the store to yourself and won’t be pushing past other brides to try on the same gown. You will have a stylist to work with you throughout your search, and you will be able to see and touch every gown we have in the store. After you “say yes to the dress” we will guide you through the rest of the process: from accessories, to bridesmaids, to alterations, we will be with you every step of the way. You are never just another bride at our boutique and we want you to feel that way! Megan Bubalo began managing Malindy Elene previously located on Central Avenue in St. Petersburg and shortly after the prior owner gave Megan her business with the hopes of growing the company. Recently, Megan moved the company to it’s new South Tampa location. Megan’s knowledge of the bridal gown industry, studies in fashion and hand selecting each bridal gown in her store during trips to New York Market, give you the personal experience all bride’s dream of. Megan has kept the sweet moments in tact of the old Malindy Elene: you still can sip champagne while having the entire store to enjoy with only your family and friends and you can customize ANY dress in the store to make it your own. She has expanded their bridal selection and also includes accessories, veils, bridesmaid dresses and even Spanx! Almost everything in the store is 100% silk and made somewhere in America, keeping the quality the highest in Tampa. Come see designers you would see on the red carpet at Malindy Elene: Reem Acra, Badgley Mischka, Anne Barge, Nicole Miller and more! Megan’s favorite thing about being in bridal? The relationships. At her boutique, you are not a number. “We know every girl by name and talk with them throughout the entire shopping and planning process! We love being a part of their wedding day and realize this is not just a dress to our brides, it is THE dress.” says Megan.